"Were having a heat wave! A tropical heat wave!" I don't know about you, but that song always goes through my head when it's hot outside. Now, I'm not one to complain that I'm hot, because you all know how much I hate winter and any temperature below seventy degrees, but, IT'S HOT OUTSIDE! I live in a three thousand square foot house without air conditioning, and I normally don't mind, because I don't like air conditioning, HOWEVER, it's gotten so uncomfortably warm in the house that last night the hubby pulled out the little room air conditioner out from storage to help cool off at least part of the house. I have a pocket door that can close off the new 1200 square foot addition, from the main part of the house, then I hung some temporary drapes in my dining room, so I can have my office, kitchen, and dining room a cool 72 degrees. But my third floor is an oven! I'm afraid the candles will start melting soon! Doesn't it look cool and refreshing? I put Stickles on the lemons, lemonade, and ice cube. The lemon slice button is from Colorbok 'The Sweet Life' and the paper is DCWV 'Lemon Flower'. I used a paper doily and ribbon for embellishment. I love this Amy! I remember that set and you've done a wonderful job using it on your design! Such a perfect thing to have on a day like today! Amy that looks totally refreshing as we have been in a heat wave this past week in Toronto, over 90 everyday. My hubby is currently working in Wisconsin and he said it has been crazy hot there. Now I know he speaks the truth. LOL Love your card and thank you so much for sharing with us this week at CASology! Such a classic, refreshing image! Thanks so much for playing along with us at CASology this week! Wow, it sounds 'hot' down your way, hope you manage to stay cool and that your candles don't melt! Your card is a breath of 'coolness', great colours and love the sweet Stampin' Up image. Perfect image for these sweltering days! Love how you framed it with the doily too. Thanks for playing along with CASology this week! 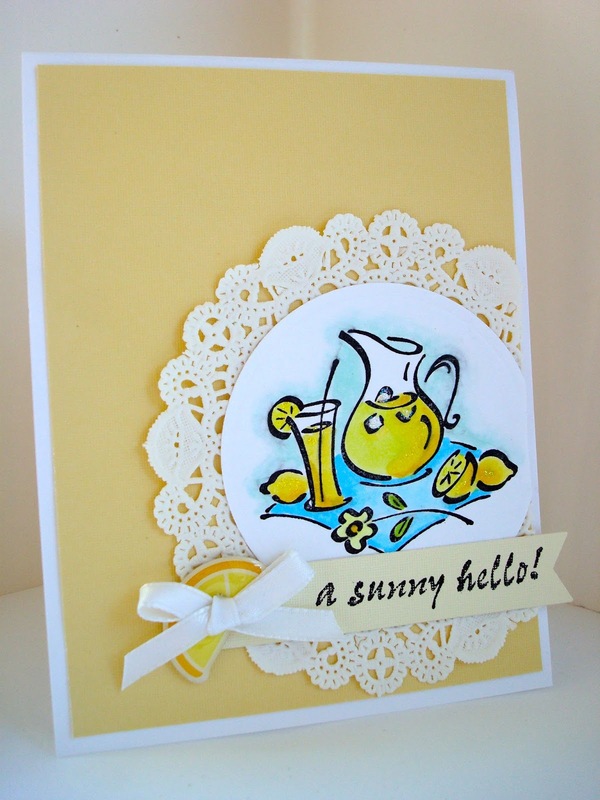 gorgeous card... your coloring is fabulous and that little lemon button is just the perfect touch!! thanks so much for playing along with CASology!